Do you often meander through life feeling as if you have problems to solve? Everything seems to be an issue? You’re not where you want to be in life? Do you hear yourself complaining about the smallest of things? But you feel irritated by these small things, that they don’t feel that small to you? In fact, you may have even answered, ‘No, I don’t complain about the small things …’ But actually when you put things into perspective they really are the small things. Concentrating on what isn’t going right in your life is a sure way to bring more of ‘what isn’t going right in your life’ to you. The best way to start counting your blessings is listing all the things you are grateful for. Gratitude will lead to more blessings. This is the way the Law of Attraction works. Once you understand this and see it working, you will get a buzz from counting your blessings. Your weekly therapeutic creative writing exercise is below … even if you feel blessed, this exercise is definitely worth doing, as it will consciously bring forward all those things you are grateful for, which will lead to even more things to be grateful for … more blessings. Does the above sound like something you would say? Do you really feel as if you have the weight of the world on your shoulders and you really don’t know how to move forward? Sometimes we have to go through challenges to reach the other side. There are better outcomes once we’ve solved the issues that are holding us back. If you haven’t read the Angels post from last week, do so when you can. I truly believe in every hardship, barrier or problem there is a lesson to be learnt. Our Angels don’t want to punish us, far from it, but they want us to live a better life and sometimes we can’t see that better life, because we think, ‘this is it?’ ‘How can things get better?’ It’s times like this you need to try and let go, concentrate on things you can do something about and truly look at the things that make your life blessed. Try thinking about being blessed without including material things … go deeper, spiritual and connect with a higher power. If you have a highlighter, it is very useful for this exercise. How blessed do you feel? Using the ‘free writing’ technique, try to expand on this, why do you feel the way you feel? For example; if you have written down that you don’t feel very blessed, try to explain these feelings to yourself by writing this down. If you have written down, you feel extremely blessed, write down why you feel so blessed. Whatever your answer, delve deeper. It doesn’t matter how long you write for, what matters is that you write and try to get an understanding of how and where you are on the ‘feeling blessed’ scale. So now, I want you to read over your thoughts and highlight anything negative. This isn’t me asking you to dismiss your feelings or emotions, this will help you understand how much your negative thoughts are taking over your positive thoughts. Ask yourself how much of your words are highlighted compared to your un-highlighted words. If you haven’t highlighted any words, well done! This means you are on the right track for counting your blessings. This should feel amazing. Keep hold of your script and in moments of doubt, read through these thoughts. If you have highlighted words, this is absolutely fine and perfectly normal. This is why I’ve created these exercises, to help you develop a positive mindset, even in those times when you don’t feel so blessed. Firstly look at the highlighted words and ask yourself can I do anything about them? If you can do something about them, great … write down what you ARE going to do. This in itself is a blessing. Some problems have no solution, we have to ride out the wave and wait patiently. But even then, all is not lost, concentrate on the things you CAN do something about. Once you have completed the above, now write down 20 blessings in your life … from the fact you can get up on a morning to the natural beauty that surrounds us. The last part of this exercise is great when sitting outside in nature. Gratitude is one of the most important elements in creating a life of blessings. Once you start to appreciate that you are truly blessed by simply being, you will feel elevated to a wonderful spiritual level of divine existence. If you can practice daily becoming more attuned to your spiritual self, you will find yourself feeling truly blessed always. This doesn’t mean problems and barriers won’t come your way, but how you deal with them will make life much easier, because you’ll always remember how blessed you truly are. I’m not sure the actual point in my life when I started to really ask my angels for help. I’ve always believed there are signs around us, telling us if we are moving in the right direction, I truly believe we are constantly being guided by signs. I also believe fully in the Law of Attraction and being guided by the Universe. So although, I can’t remember the exact moment in my life when I became aware of signs from the angels, however, most of us turn to spiritually because of ‘a reason’. Something has happened in our lives that force us to seek help outside of the ‘perceived’ physical world we live in. When you begin to realise that our angels are always with us, you won’t just ask for their help in times of need, you’ll be forever grateful for their constant intervention, support and love. Once this becomes second nature, when there are times of emotional or physical upheaval, you will deal with your problems, barriers and circumstances in a calmer and more positive way. So how can you do this? How can you connect with your angels and silence your mind? There are several ways you can connect with your angels, however, I highly recommend, the lady who is renowned as the Queen of Angel Therapy, Doreen Virtue, you can see some of her books here that I recommend. I personally, carry around an angel in my purse at all times, plus, I wear a feathered angel wing necklace and bracelet. If you’re interested in keeping your angels with you at all times, you can see my favourite angel gifts for yourself or as gifts for others here. I’d also like to start the New Year with one of my popular Therapeutic Creative Writing Exercises, on how you can notice signs from the angels. This week, let’s start with a bit of ‘free writing’. Free writing is a form of therapy that can help you understand your emotions, feelings and thoughts better. So, find yourself a quiet space; space where you feel comfortable and can relax. The trick is to close your eyes for 10-20 seconds and let your thoughts flow. Let all those thoughts that collide with each other flow through your mind, then write. That’s it! Free writing is a great way to express your emotions, by writing them down you can actually see your thoughts on paper. It’s said that we have between 50,000-70,000 thoughts per day, which is between 35-48 thoughts per minute per person. That’s a lot of thinking! So hopefully you can see by writing down your thoughts, it will help you to see a pattern or give you more clarity. Write for as long as you need, some people may need 10 minutes, some may need an hour. But once you have finished, read through your thoughts and as you do try to signify where you need help. This could be a situation with your career, family, relationships, health, whatever you feel is holding you back at the moment, bring that to life. Write down how the angels could help you. You don’t need to write down every time you would like help from the angels, but in this exercise, it will help, because you can identify where you would like the angels to help. Once you’ve read these, why not have a go at this week’s inspirational task, and even take a look at the therapeutic creative writing exercise that will help you find your zing for life. Ask yourself: How can you find your Zing for life? I’ve said this previously, but I love this word. Zing is like sparkle that shines from you. Wouldn’t you like to find that sparkle and spread it like glitter? Wouldn’t you love to feel utter happiness? Can you truly be that happy? Yes, yes you can. How? Finding your zing, is like ensuring that your soul is connected with the greater good. Although, I’m asking you to refer back now, but it’s important that you think about all of the things we practised in these blog posts. You must feel gratitude, you must feel love, you must at peace … once you have achieved these, you will find your zing. Your zing is there to spread to others, a bubbliness that will spread across people like a blanket of warmth. I get my zing from life in general, but I become zingier when I’m writing, either my books and or these blog posts. I want to spread as much zinginess as possible. I want you to feel your zing, so does God, the universe and your angels. So this week, look back through these posts, practice gratitude, practice love … it won’t happen overnight, unless you really up your game and truly feel it, then magical things will happen. Trust me. But it can take time and daily practice, hence the reason I’ve created my inspirational book, for you to download and be surrounded by inspiring messages. How to find your zing for life, you can read the previous blog here, as with all inspirational words from our A-Z journey it features a therapeutic creative writing exercise. You can also see below the ‘zing message’ we are spreading through inspirational clothing, as you never know who needs to see your message. See a range of tote bags, posters’ and clothing for ladies, men and children, all designed to inspire and motivate you and others. Clothing that spreads inspirational messages … available in MANY different colours. I truly hope you get something from my words. When I was at my lowest, I inundated myself with quotes. I even started my own spreadsheet of quotes. I remember updating my spreadsheet while sitting in one of the spare bedrooms of my in-laws’ house, my two-year-old cuddled up to me, while my newborn laid in the crib next to the bed. I remember thinking, I have to stay positive. We have to get through this period of helplessness; lost businesses, family disputes, mental health problems, financial wreckage … it was safe to say, I was so grateful to my in-laws for putting a roof over our heads and food in our mouths, as I’m not sure where we would have ended up. I keep this short, as this part of my life is a novel in itself. But I want you to know, life is full of lessons … it’s up to us to face those challenges, knock down those barriers and keep going. Staying positive is easier said than done when you’re faced with daily struggles, but I trained my brain to only look at the bright side and block out the negative. By doing this, the Universe showed me that I can have all that I dream of and life can be magical, miracles do happen and life can be pretty awesome. I developed my spreadsheets into daily inspirational quote books. A few years later, when I started my MA in Creative Writing, I totally connected with reflective writing. Hence the reason, I developed therapeutic creative writing exercises on my blog. Since then, I’ve never given up on inspirational messages. I love them; I wake up to them, I go to sleep with them. I have my own affirmations. I want everyone to know the power of the mind. The power that you have to inspire yourself and others, no matter how much you feel this can’t happen for you. Trust me, from someone who felt the same, it can happen for you. YOU can make it happen. Remember, the Law of Attraction is always working, so if you feel negative things are happening in your world, listen to your thoughts, look for things to be grateful for, look for things to appreciate and watch your world become blessed with miracles and magic. Fill yourself with positive thoughts and watch the negativity fade away. How we see these messages can be through various forms, but sometimes people are not looking for them … but they need them. This was one of the reasons I created my online inspirational clothing store, as you never know who needs to see the messages & how it could help them at that moment in time. I hope you find something that will help spread love, inspiration and encouragement. Victoria is a women’s fiction author, published by Bombshell Books. Following her own dreams, she was ecstatic to be published by Bombshell Books. The 2nd in the ‘myself series’ will be released at the end of September. She hopes by writing her inspirational blog and promoting her inspiring clothing, she will help others pursue their goals. Spreading love and positivity always. Once I started reading this I couldn’t put it down. I found myself laying awake at three in the morning one night trying to finish it even though I had work the next day! Once you’ve read these, why not have a go at this week’s inspirational task about staying young, and even click back to the therapeutic creative writing exercise to help you become a younger you! You can also see the ‘message of staying young’ we are spreading through inspirational clothing, as you never know who needs to see your message. How to become a younger version of you, you can read the previous blog here, as with all inspirational words from our A-Z journey it features a therapeutic creative writing exercise. Ask yourself: How old do you feel? Not how old you are. How old do you feel? You may know people who are your age and you think they seem younger than you, but this is all in the mind. These people have a positive mindset. People who feel younger, do things that make them feel younger. It’s all a bit of catch-22, I know, you need to feel good to be doing something that makes you feel good. However, let’s turn this around … do something that makes you feel good. If you’ve been reading my blog posts, you will realise by now the Law of Attraction gives you what you give out there. So, let’s think about this … if you’re feeling old, the Law of Attraction is going to give you more of that old feeling. So if you could do something that would make you feel younger, what would it be? This week, think about something that you love doing, something that you enjoy, something that gives you energy … and do it! We often put our hobbies or favourite things on the back burner, because we have so many things to achieve in a day, but like the relaxation post says, you need to relax to get more done. Once you put all the pieces into play, all the pieces that fit with the Law of Attraction you’ll realise how it all comes together … what you put out there, is what you receive … so this week do something that makes you feel younger and truly appreciate that feeling. Breathe it in, enjoy it and more of it. Following her own dreams, she was ecstatic to be published by Bombshell Books. The 3rd in the ‘myself series’ was released at the beginning of December. She hopes by writing her inspirational blog promoting her inspiring clothing and digital downloadable prints, she will help others pursue their goals. Spreading love and positivity always. Once you’ve read these, why not have a go at this week’s inspirational task, and even click back to the therapeutic creative writing exercise that will help you manifest your dreams through excitement. You can also see the ‘excitement message’ we are spreading through inspirational clothing, as you never know who needs to see your message. Clothing that spreads appreciation inspirational messages … available in MANY different colours. So go on, manifest your dreams through excitement, you can read the previous blog here, as with all inspirational words from our A-Z journey it features a therapeutic creative writing exercise. Ask yourself: What am I excited about this week? Once you become excited about life. Life will provide you with lots of excitement. Don’t just become excited about ‘occasions’ that are happening, start thinking about everyday things. Become excited about things going to plan. Visualise your day ending nicely. Everything happening as swimmingly as it could. Wouldn’t that make you excited? A day without hassle, a day without unexpected hiccups. Start enjoying those around you, family, friends but enjoy spending time alone too. Simply become excited about these everyday things that you may be taking for granted. Truly think about this … take time this week, to become excited about spending time with a friend or family member. You’ll soon find yourself enjoying the simple things in life. Your gratitude levels will increase. Your love levels will increase. Your joy levels with increase … and if you’ve been reading my blog posts, you’ll know that the universe will deliver all this happiness back to you. 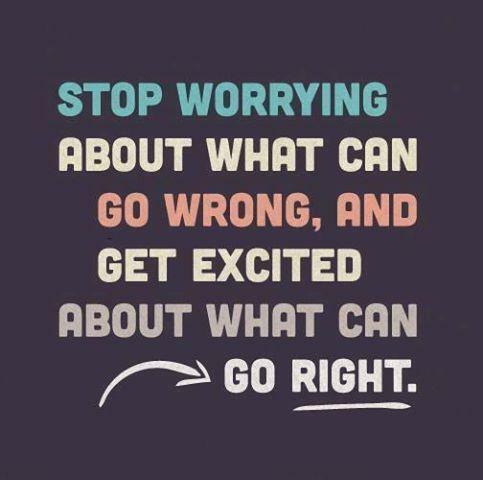 So go on … this week get excited about life!